More "New Generation Console" shooting madness. Looks like the small companies are taking the place of the big business in the shmup scene, this time is the Swizterland-based game development studio Polarity Flow with its lone title, Steel Rain X for the XBOX One, PlayStation 4 and PC (via Steam). Yeah, not all the independent games come from Japan or the US, and knowing how well made are the things created in the "Old Continent" of Europe, we can expect a great work, or at least a convincing game. Shooting isn't just flying around blasting things out of existence, there is a time where elements from other gaming genres are added to the mix, most of the times are from the RPG genre such as leveling up and using money to power up. Examples are everywhere: E.D.F. Earth Defense Force, Fantasy Zone, U.N. Squadron / Area 88 and Carrier Air Wing / U.S. Navy are the most obvious examples. Steel Rain X is very familiar with those features. The game features three modes: Campaign, Arcade and Survival. Campaign is your "Main Game", where you can select your starting planet, There's already one planet complete, which is the "Tutorial" world. Each planet has three stages, and once you defeat the boss in the third level, you can Colonize it (I'll explain that later, by now let's focus on the gameplay). 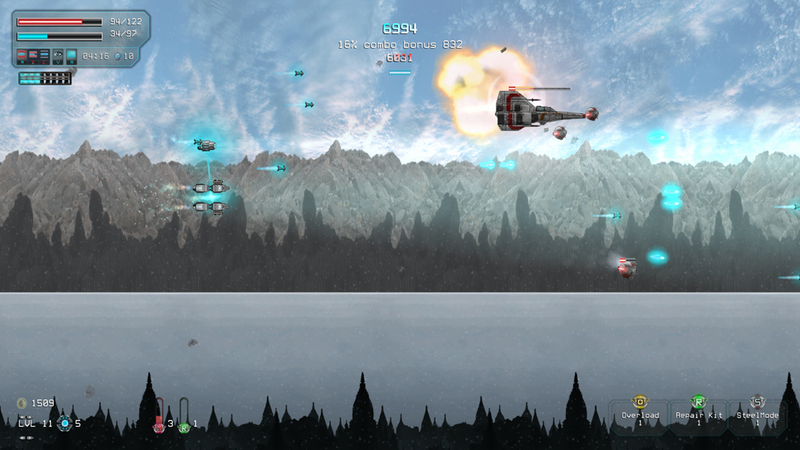 The game looks like your typical horizontal shooter, however your ship can use three weapon modes called "Formations". FORMATION A: Your basic frontal/spread attack with a rapid shooting pace, useful for most enemies. The bullet pattern depends on which weapon is being used. FORMATION B: The "Power" formation, the shooting pace is reduced in favor of stronger shots, like in Formation A, the bullet pattern changes depending on the weapon color. FORMATION C: Double-edged lightsaber for close range attacks in both frontal and rear sides. The beam blade doesn't change its shape with any weapon color. Firemodes are your variety of weapons, to power them up, you have to pick the same color multiple times, like the traditional powering up system of the first Raiden games. FIREMODE BLUE: This is the basic shot. Starting as your basic spread shot, but as soon as its powered up, it will become a 360° way shot that covers the player of multidirectional enemies becoming the ideal weapon for beginners. Also, it will activate a shield arround the core. The shield absorbs a limited amount of damage before it needs to be reloaded with a new battery or active skills. FIREMODE RED: This is your full frontal fire designed to inflict the most damage possible. Research and learn new skills to unlock heavy attacks and the Missile Void active skill. FIREMODE ORANGE: This Firemode fires in two directions: Frontal and rear, like the Tailgun from Gradius III but in a more fast paced-rate. This Firemode can maximize both rear fire output and laser attacks. FIREMODE YELLOW: The yellow firemode is also a Frontal attack, but with two small shots aiming up and down for a Three way fire. It is also designed to maximize the income during missions. You can learn to manipulate resources and even research new technologies to repair your wings with converted materials. FIREMODE GREEN: Another Spread shot with a fancy waving frontal fire. This firemode collects green batteries to spawn repair drones. Your ship will be repaired over time as long the drones are active. Learn to improve the repair speed and research active healing technologies. Along with your Formations and Firemodes, there's other weapons at your disposal. OVERLOAD: This is your "Bomb" that destroys the bullets, you can find them as floating items which are triggered after pick-up, and available on the Item Shop for later use. Later use Overloads are activated by the Left Trigger button and the player can hold a maximum of 10 in both Campaign and Arcade modes. REPAIR KIT: This item allows you to regenerate some of your HP (Hit Points) so you can keep on flying and fighting for much longer. like the Overload, it is available as both "trigger at pick up" and buy and use later on the Item Shop. It is activated by the L Button. Your ship can hold 10 Repair Kits in Campaign and 6 in Arcade. STEEL MODE: This is your "Temporary Invincibility" which makes you undefeateable for a very short period of time, good enough to survive tight spots and enemy spam situations. The time duration of this item can be researched. This weapon is activated by the R Button. The player can hold only 3 of this items in Campaign and Arcade modes. There's also small companion units called Drones which kinda work like the Options from Gradius and the XA-1 satellites from E.D.F. Earth Defense Force. They can take different formations like following your ship or rotate around it like a shield to absorb bullets, along with their function of providing additional firepower. There's three "Main Objectives" in this gameplay to achieve your path to victory. The first one is re-taking enemy controlled planets, like i said before, you can colonize them and build many types of buildings. The second one is racking up large ammounts of money to do that. Because things such as sending a Probe to colonize and build structures have their respective prices, not to mention you have to buy items, drones and upgrades for your ship, and new ships (or Wings like they're called) with greater focus on defense or offense. Last priority is to level up your ship. Not just for power-up and increase your HP, but for purchase upgrades. Gaining money will immediately become the "Top Priority" of this game. 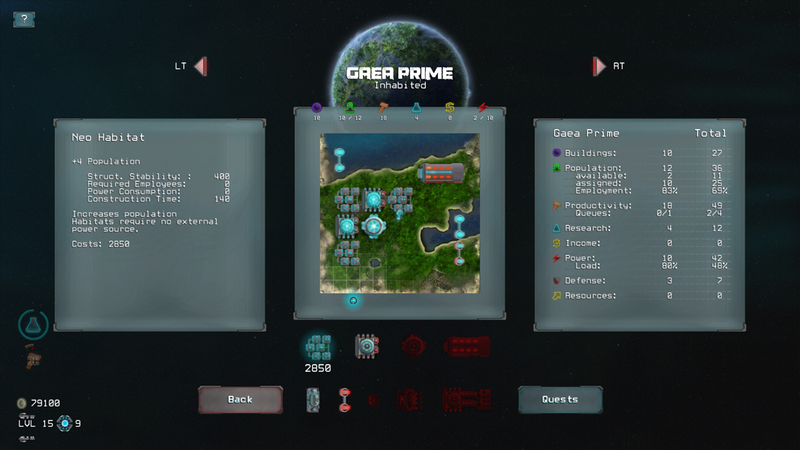 As the basic upgrades have a slightly moderated price, along with building structures. However, if you die on a mission you'll lose part of your Credits as the repair costs, so, surviving the mission is a life-or-death priority. To level up your ship, you have to collect Energy-points dropped by destroyed enemies. Luckily, there's two types of Energy items: 1-point and 10-points. This are your Experience Points, once your Exp. gauge is full you'll get a level up, requiring a few more points. Also, you will get one Skill Point with each Level up. This are used to improve the properties of the 6 weapon types (or Firemodes), each Firemode has five different properties that requre from 1 Skill point to 4 of them. Once a Firemode is fully upgraded, you can unlock its Elite Skill, which can be powered up 1/5 per Skill Point. Kinda remids me of the Armiger from Final Fantasy XV and the Ether evolution tree from Xenosaga. Unfortunately, you can not upgrade all the Firemodes to its full Elite power. For some reason, the game's maximum level is 60, contradicting the normal 99 levels in RPG, which this game borrows that element from. Also, as you climb on levels, the Energy gauge will require more, however it's maximum requirement will be 990 Energy points. At first looks long and too demanding, but the truth is you can pick that ammount of points in no-time, either completing or fail-and-restart a level. Like the SNES port of U.N. Squadron, you only have one try to complete a level, however you have unlimited lives as the money you pick in your attempts pays the "Repair costs" of your Wings. However, restarting the level will not reset your Energy points, so you can use it to level up until you get the desired level in the old "Die and restart trick" that SNES players will remember well. Another feature of the game is the Ranking system, which works based on what difficulty you played the levels. Playing on Level 5 only gives you a Rank A, but also a small income for clearing the level. The only way to get the full rewards is by climbing the difficulty to level 10, however, the game doesn't become as hard as you imagine since you can clear a level and reach Rank S, not to mention as long as you keep leveling up your way to Level 60, it'd become way too easy. Only Xenox Prime and Telaros Rift are the only planets where the game can be challenging even on those levels. Reaching Rank S isn't just surviving the level, also, making a great score and completing the level within a time limit. The score system is an interesting feature, as you can create a combo by destroying enemies without getting hit once and picking items before the "Combo Timer" expires. The items reset the timer giving you more chances to increase your bonus score. the stages are short to give you more than enough time to complete the levels. If the time runs out, nothing happens, you don't die like in Super Mario Bros. or Castlevania, so it's pretty much like Super Star Wars. Selecting your weapon, drone and Wing is quite unorthodox as you have to go to the Weapon option, then select your Wing, Firemode and Drone. The Formation is selected by the game and this is how it works. You have to leave the Weapon menu on the formation the ship is "auto-displayed", that's gonna be the Formation that you'll have at the start of the level. It's basically the same as Raiden DX where the lightning bolt in the "DX" decided if you had red or yellow bombs. Colonization is another fundamental part of the game, at the beginning you can only colonize the "Tutorial Planet", but its already a good start to gather some resources. Building things in this game is pretty much like SimCity, however in Steel Rain X, you need to build a Habitat (House) before building an Power Plant, then you can build structures to extract resources and the most important of all: Trade Hubs. This buildings are really useful because they add an extra money boost without engaging, and the more you build the income increases. However, you can't just leave the game and just wait until you get the desired amount of money. The game will randomly send an enemy fleet to attack your colonized planets, so you're gonna be busy defending your planets. You can also build laser cannons, so your planets can defend themselves, or you can select the "Orbit Patrol" to engage against randomly generated enemy squadrons. Like Zanac AI, each Orbit Patrol level is different so you can't be familiarized with the enemy and bullet patterns. This mode is also practical to gain more Experience and money, so this is one of those instances where the game puts a situation in your favor. However there's some disadvantages in the colonization. Like SimCity, your buildings will experience blackouts if your Power Plant can't produce more energy, so you have to build another one. And if your population number is already full you can't build until you have another Habitat like in Age of Empires. But the worst part is that the map is simply too small, even for the 8 planets available, a 10x10 grid is just too short and for worse, not all the full grid is available to build. So you have to know where you're gonna place the most elemental structures like Factories, Research Labs and Steel Citadels. Building a Trade Hub isn't just a money boost, it also gives you the option to buy Xenox Material and Energy points, however, buying Experience points can be too expensive, so it is required to build multiple Trade Hubs and colonize around 7 planets to rack up enough money. In the Factory will refine all the Xenox Material you buy from the Trade Hubs, the game will process a certain quantity of Xenox Material to create new upgrades to be installed on your wings. It also creates items that give you 10 or 20 Energy points for another extra boost in your leveling up priority. Research Lab will unlock the Research option in the game's menu. 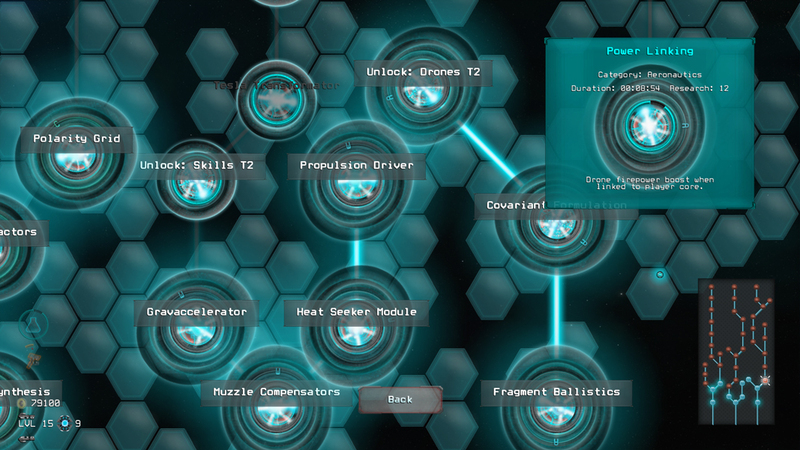 This new option allows you to unlock new technologies for your buildings, ship and weapons. However, researching will take a lot of time because it can only research one thing at a time, and the research time depends on the number of Research Labs built on your planets. If you have one you can take from 40 minutes to 1 hour and a half. Oh, i almost forgot. I've found a trick to gain money and WITHOUT worrying about the "Colony under attack" thing. To make this trick work at its best, you're gonna need enough Trade Hubs to generate 1,800-2,100 Credits per/5 seconds, to do that it will require colonizing 7 planets. Then select a mission and get killed. Once you're in the "Connection Lost" screen, don't select any option, the game will be racking up money even if you're shot down and the mission time expires. Just leave the game alone on that screen and return until you get the desired amount of money (just move the cursor to prevent the console to turn off). This trick is very effective to buy Xenox Material and Experience items. 20,000,000 credits are good enough to research stuff and gain a few levels. The second mode is the Arcade mode, while at first it looks like the same as the Campaign, the game omits the plotline in favor of the instant action. For the sake of putting the player in the game immediately, the upgrades and researches are omitted and the player is sent to an Upgrade select where you can only pick two of 6 upgrades kinda like McCoy's Storehouse from U.N. Squadron. Like in such game, you can decide if you want to use your upgrades or not. I guess Skill points can be accumulated for later use, but it's a bad idea since increasing your HP is a life-or-death priority. However, the game sends you to the battle with 10 Overloads, 6 Repair Kits and 3 Steel Modes. Either if you die or clear the level, the game has the courtesy of restock this three sub-weapons. Once you completed the "Planet levels" you'll be on the store with 2 Skill Points. Also, the Orbit Patrol becomes the inbetweener of one planet to another. For an "Arcade-like" gameplay, you can save your progress and keep your score, something that really comes in handy when you only have time to play one or two levels. Survival is your "Arrange Mode". The gameplay looks identical to the Arcade mode however there's two significant changes: First, there's no upgrades of any kind and second, the game doesn't save your progress. If you're lucky, the farthest you can to of the game is reaching the first "Orbit" level, that's gonna be the final grave of your ship. ¿Thought Triggerheart Exelica's Arrange Mode was hard-as-nails?, then this is much more difficult. There's an "Editor" option where you can create your own levels from backgrounds to entire enemy formations, the only limits are your imagination and beign overwhelmed by your own enemy formations. Graphically, the game designers decided to bring something a little different from the usual human piloted aircraft, as your ship is a pair of wing-like frames connected by an energy core. Your ship is appropiately called "Wing", quite unexpected but yet an interesting from the traditional piloted stuff. However, your enemies are the classic combination of fighters and mecha of multiple sizes, but in large numbers with unique attack patterns. You can also see how much life do they have before they go down which is helpful for those who get desperate to know "How much are gonna resist until they die?". As for the background we have a combination of a still background and multiple moving layers in the style of Zanac AI, giving the illusion of engaging in really fast speeds. Along with that there's a rain or snow extra layer for a more submersive atmosphere. There's also a few human characters in the game's story. Like in the Argentina-made Project Root and Dogos, the character design aims to the Western/Comic Book style instead of the more common anime style. This time the artwork reminds me of those from Dark Horse Comics (Star Wars to be exact). Once again don't criticize me, but after all the years of being submerged on anime, i just can't get used/re-familiarized to american cartoon and comic style drawings. 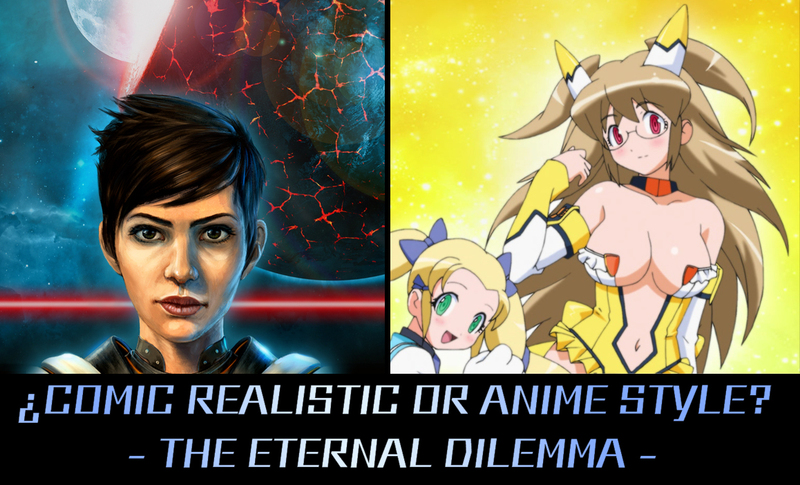 It's like "Once you go anime, you can't get back", i'm sure some of you will understand what i'm talking about. Musically, the majority of the soundtrack is pretty forgettable, to begin with the stage themes are a 1:30 minute tracks that loops until you complete a level or you die trying. Although there's a couple of good songs with involves some Alternative and Hard-rocking paces, the rest is a mixture of ambient and hip-hop beats. Strangefully, if you die and you choose to restart the level, the music will play another track instead of the one that was playing before you died. The Colonization and Research menus have 2 different themes which both suffer of the same thing: short duration and repetitivity. Steel Rain X aims to be the U.N. Squadron of the XBOX One and PlayStation 4, as it combines the strategy and economy with the shooting action (minus the license of Kaoru Shintani's Area 88 of course), despite the forgettable music, we have a mix of game elements that makes the game quite interesting and worthy of picking up.